Regarding Hiroki Kuroda, and with apologies to Winston Churchill, never before have so many written so much about a pitcher whose accomplishments are so few. As the offseason has dragged on without a big move by the Yankees, fans of the team have grown increasingly impatient, and Kuroda has become their cause célèbre. 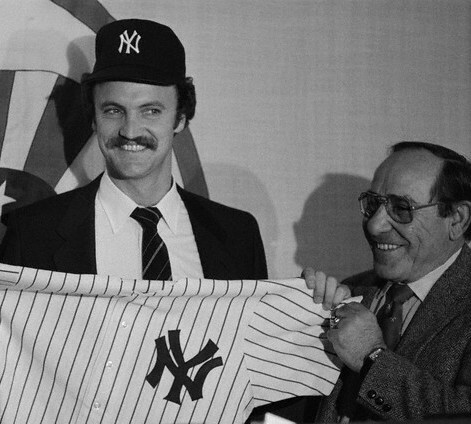 Ed Whitson sports a grin on the day he signed with the Yankees. It would be one of the last times he smiled while in pinstripes. In his brief four-year career, Kuroda has been a solid starter, posting a cumulative WAR of 8.6 and ERA+ of 114. However, the Dodgers’ right hander will be 37 next year, so, even if his transition from the N.L. West wasn’t already a concern, the risks associated with his age would be reason enough for pause. Of course, that doesn’t mean Kuroda wouldn’t represent an upgrade in the Yankees’ shaky rotation, but at the reported cost of $12 million (not to mention the corresponding luxury tax hit of roughly $5 million), it’s hard to argue that the marginal value would justify the additional expenditure. Back in the winter of 1984, the Yankees were in a similar situation. Despite having a top offensive team, which was bolstered by the earlier addition of Rickey Henderson, the pitching staff was a jumble of question marks (and there wasn’t a CC Sabathia to serve as an anchor). As luck would have it, however, there was pitcher from the N.L. West available on the free agent market. His name was Ed Whitson.